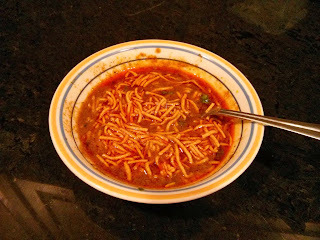 I loved the curry recipe and will be using it to make Tarri for my Puneri Misal. Diwali is around the corner - I can't wait to mix all the Faral leftovers with mataki usal and this nuclear bomb tarri. anyway - I made this bhaji for my friend Saurabh Malani, a die hard fan of this Khandeshi specialty. Saurabh did justice to what I made - he finished most of the Shev bhaji in just one meal! Feeling when you eat the Shev Bhaji - "I hate you [like I love you]!" Recipe: Basically, follow Madhura's recipe to the dot. Dry roast the coconut till golden brown. Saute garlic pieces in 1 tsp of oil till they are golden brown. Saute onion slices in 1 tbsp of oil till golden brown. Add all ingredients to the blender and grind into a smooth paste. Heat 4 tsp of oil and add the spicy paste. Saute till oil separates from the paste on low heat. Add good amount of water to make a thin curry. Bring this curry to boil. Turn the heat off. It's important to pick the right shev as Madhura recommends - pick a thick one. Curry is already spicy so a plain shev is perfect. Do not add all the shev to the curry at once. Add shev just before serving to individual portions to make sure that it doesn't dissolve. :) thanks for the endorsement!